The Circumference Method formulas for both genders. Select your preferred units of measurement. N/A, for Standard measurement only. Enter your height (without shoes on) in your selected unit of measurement. Inches for standard and centimeters for metric. Use the decimal equivalents for fractions (for 1/4 enter .25, for 1/2 enter .5, for 3/4 enter .75). If you need to convert feet and inches to inches, expand the description to reveal a mini feet-to-inches conversion calculator. Enter the average of three separate neck measurements or tap the Neck button to have the calculator calculate the average for you. To take each neck measurement, place the tape at the narrowest point of the neck, sloping slightly down to the front. For men the measurement is taken below the Adams apple. For women measurements are taken at approximately the same area. Women: The waist should be measured at the narrowest level, above the belly button (umbilicus). Another reference is halfway between the lowest rib on the sides and the top of the hips. If youíre unsure measure a second and a third time until you get the lowest value. Men: Measure the waist circumference at the level of the belly button (umbilicus). Here you do not need to find the narrowest size. Make sure the tape is horizontal. Enter the average of three separate hip measurements or tap the Hips button to have the calculator calculate the average for you. To take each hip measurement, use the widest circumference of the hips with the tape as horizontal as possible. Should be measured with minimal clothing or underwear. Relax the buttocks (gluteus muscles) and spread the feet to shoulder width. This calculator will help you to calculate your body fat percentage using only a tape measure. 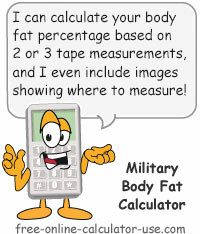 The calculator's calculations are based on the Circumference Method, developed by the military (U.S. Navy and U.S. Army) for estimating percent of body fat. Pictures showing where on the body the tape measurements should be taken from, for both males and females. While a skin fold test using a body fat caliper is considered to be the most accurate, this calculator will allow to get a close estimate without having to go out and buy a caliper. Enter your height in inches or centimeters. If you are working with Standard measurements, expanding the description will reveal a mini calculator for quickly converting feet-inches to inches. For women, enter the average of three measurements for each of your neck, waist, and hip measurements. Men enter your neck and waist measurements only. Note that for each measurement line, tapping the plus icon will expand a form wherein you can enter three measurements and the calculator will compute the average for you -- plus enter it into the field where it belongs. The expanded form also includes an info icon, which when tapped, will open a popup explaining how and where to take the measurement. Click the "Calculate Body Fat Percentage" button. This will generate your results for body fat percentage, body fat weight, and lean body weight, plus display a pie chart comparing your fat weight to lean weight. Circumference method, formulas, and body fat categories. The Circumference Method is body fat percentage formula developed by the U.S. Navy for using two and three tape measurements to estimate body fat percentage.